When hearing the names Neptune or Poseidon, many people conjure up the same image, that of a sea or water god and the horses, and always with a trident. And indeed, they are both sea gods, however, whether or not they are the same god is up for debate. Many believe that the Romans simply adopted the Greek god Poseidon and changed his name to Neptune. However, even if they are referencing the same god, their depictions are different in several key aspects (despite the fact that in art they frequently look very similar). Other differences are also notable. The primary reason that Poseidon and Neptune are considered the same god is because some think that they actually are. Essentially, Poseidon is the Greek Neptune and Neptune is the Roman Poseidon. This would be an issue of semantics, and there are many commonalities in both the Greek god and the Roman god mythology to suggest their equivalence. Both structures had a god of the sea, a god of the sky and a god of the underworld. In Rome, this was Neptune, Jupiter and Pluto. In Greece, it was Poseidon, Zeus and Hades. Much as with their roles as gods, the origin story of Poseidon and Neptune are quite similar. 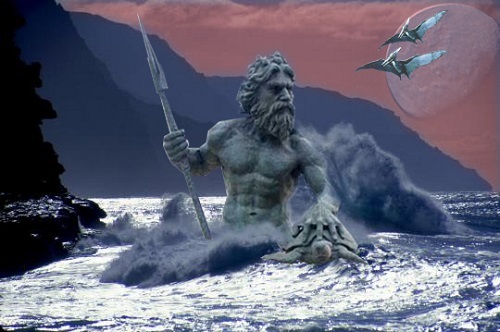 Poseidon was born of the gods Cronus (Kronos) and Rhea. 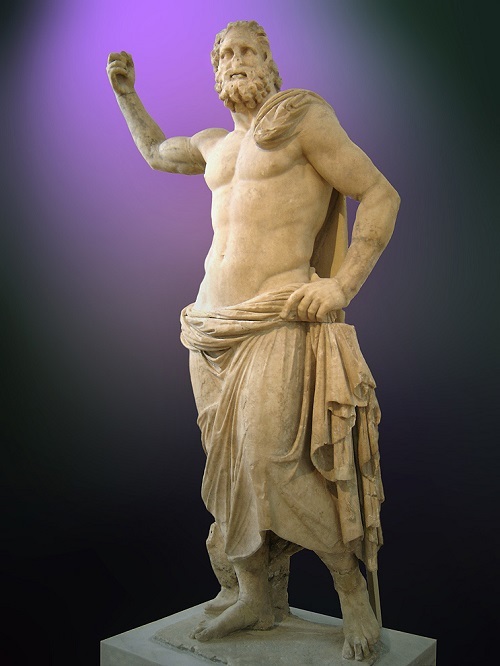 Cronus ate all of their children at birth until Rhea tricked him into eating a large rock rather than their sixth child, Zeus, which forced him to throw up all of the other children from which the Greek pantheon began to develop. The emergence of Poseidon’s origin story is likely related to the first Greek speaking people who enter the Arcadian region during the Bronze Age, who mixed their religious beliefs with the local indigenous population. There is some speculation that only a few gods were brought in by the Greeks, of which Poseidon was not one and initially he appears in the mythology as a horse representing the river spirit of the underworld. This representation is common in norther-European folklore as well. In a similar myth from Minoa, the goddess Pasiphae mates with a white bull (considered the pre-Olympian Poseidon) and gives birth to the Minotaur. In the Mycenae region, there is thought that Poseidon was not originally connected to water or the seas. The origin story that results in Zeus exterminating Cronos and naming the gods to their corresponding realms is upheld by Homer and Hesiod in their writings. However, it is still unclear whether Poseidon was first worshipped as a horse god or god of the seas. Like Poseidon, Neptune was worshipped as a horse god as well as a god of the seas. His mythology includes the story in which he creates horses through his affair with Medusa. [iv] Another speculated difference between the two gods lies in the geography of the regions in which they were worshipped. The Latin population did not have access to a major sea initially, so the god Neptune was the god of fresh water in the beginning. It seems likely that the characteristics for Neptune were adopted from the Greek Poseidon, but combined with the Etruscan god, Nethuns, the god of the gall-bladder. 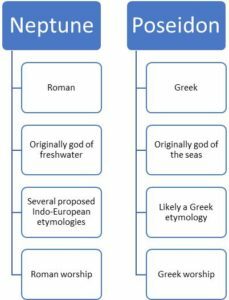 The origins of the name Poseidon are unclear and include two primary theories. The first speculates that it is derived from the Greek word meaning husband (posis) and the word for Earth (da). The second theory interprets the word root word dawon to mean water , and Posei-dawon to indicate master of the waters. And finally, there is also the possibility that the word has origins that pre-date the Greek culture. Like Poseidon, the etymology for Neptune is unclear and there are multiple interpretations. Varro posits that the name is derived from the word neptus, meaning covering, and nuptiae, as marriage of Heaven and Earth. Another theory derives believes that it comes from the Indo-European word for moist, neptu and yet another believes it comes from the same region, but is derived from the word nepot, which means descendant, or sister’s son. In the late 20th century, another belief emerged, which combined the words nebh, which means damp or wet, with the word worso, meaning to water or irrigate. The expression of worship to Poseidon was expressed in several ways. He was the chief god in many Greek cities, including Corinth and was second to only Athena in Athens. He was known for using his trident to cause earthquakes at times, causing many in the ancient Greek world (including Alexander the Great) to offer sacrifices in the form of horses in order to ensure safe water travel. Poseidon was also known to be one of the caretakers of the oracle at Delphi, prior to Apollo. He was also considered to capable of causing certain forms of mental issues, including types of epilepsy. Neptune was worshiped at his own festival, which would occur at the height of summer and was called the Neptunalia. This festival was devoted to the work of conservation and draining of superficial waters. This is primarily due to the fact that Neptune initially emerged as the god of springs, lakes and rivers in the landlocked region. Due to this initial connection, it is thought that perhaps Neptune did not become a primary god until much later in his evolution than Poseidon did. In the city of Rome, he only had one temple located near the Circus Flaminius racetrack. He was considered to be one of only 3 gods for whom a sacrifice of a bull was considered appropriate. Rikki Roehrich. "Difference between Neptune and Poseidon." DifferenceBetween.net. September 12, 2017 < http://www.differencebetween.net/miscellaneous/difference-between-neptune-and-poseidon/ >.